I’ve always had a thing for lighting – there’s just something about a big, impactful chandelier that makes my soul happy. When we moved into this home, we inherited what is quite possibly the most hideous light figure that has ever been placed on this earth. No exaggeration. It’s awful. So, once we were settled and ready to start making some changes, the dining room chandelier had to go. We knew we didn’t have the budget for the fancy chandelier of my dreams, so we decided to tackle the problem head-on and make something ourselves. We’re nothing if not adventurous. It took a lot of time and planning (and a lot of crazy looks from the poor employees at Lowe’s), but we did it and survived to tell the tale. And today, I’m gonna tell you all about how to accomplish this look on your own. And guess what? It costs less than $300. Trust me. You’re gonna want to see this. Let’s get to the explanation. 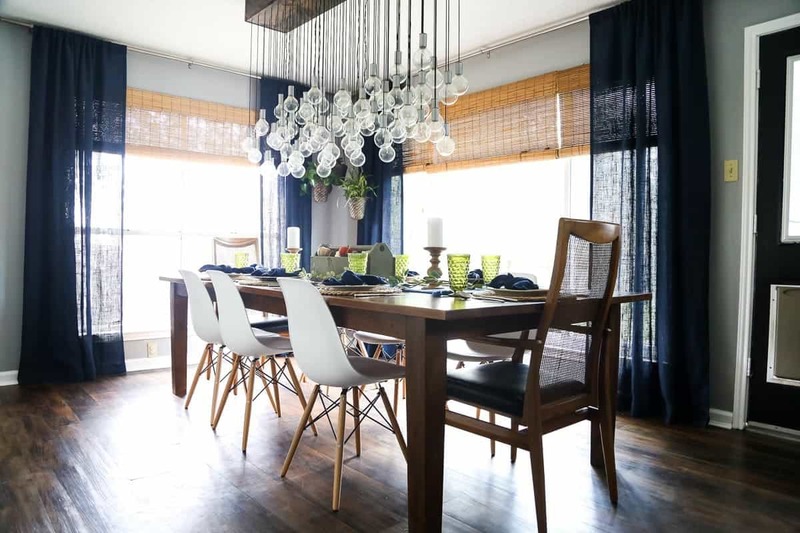 We started off with a 6-foot 1″ X 12″ – we cut it down to 5 feet, because that was the size we felt worked best with our dining room table (which is 9 feet long). If you choose to do this on your own, any length will work, you just may have to adjust the number of light bulbs accordingly. Then, it was time to mark off for our holes. We started 1 inch in from the edge and marked every 3 inches after that (so we had marks at 1″, 4″, 7″, and 10″). We made marks on each side of the board, then used our straight edge to draw four lines running all the way down the board. Next it was time to mark the rest of the rows and figure out where the working lights would go. Our bulbs were 3 inches across, so we decided that 20 rows of 4 lights would work best. We went down each line and marked every 3 inches to indicate where the rest of the lights would go. 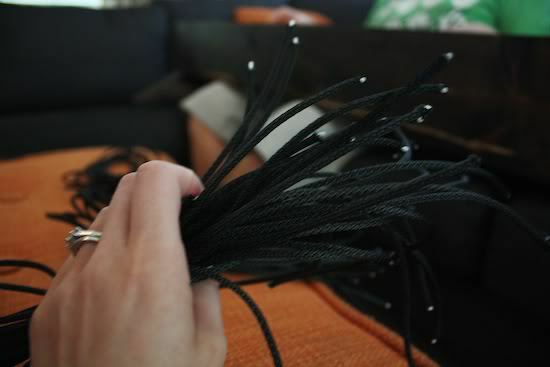 Then came the part that hurt our brains a little – deciding where the working lights would go. We had decided on 20 rows of 4 lights, which meant there would be 80 light bulbs. 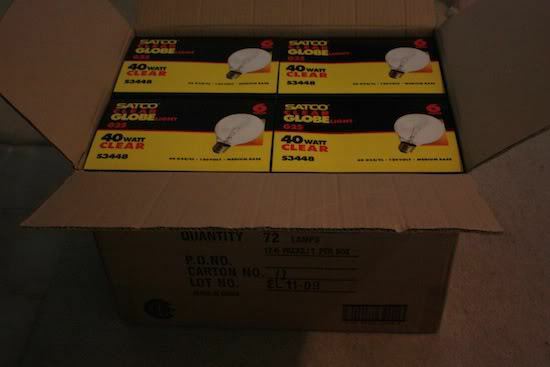 Obviously, we weren’t interested in having 80 working light bulbs – that would be not only entirely too bright, but I don’t even want to think about how much it would have cost us to buy 80 light sockets. So, we decided that 10% of the lights would work, meaning we needed to mark spots for 8 working lights. I’d love to give you some awesome method for figuring out which lights should be working, but it was a lot of trial and error for us. 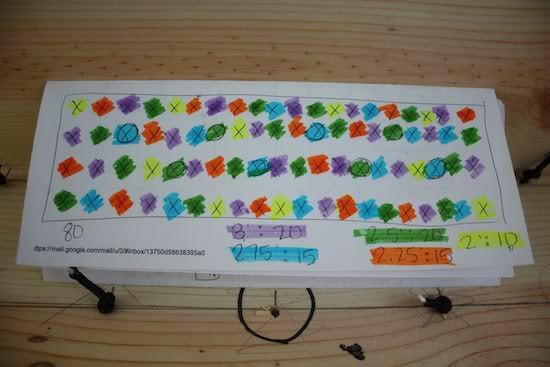 We played around with a bunch of different configurations (marking them with a pencil) until we found one in which they were all nicely spaced and looked pretty random (even though it totally wasn’t) and we marked where the lights would go by circling their dot with a sharpie. Then, it was time to construct the box. We wanted something with a nice, large base that would camouflage the fact that the light socket hole in our ceiling is wildly off-center. We also needed room for a ton of wires since we would have 8 working lights, which meant we needed it to actually be a box that had some space from the ceiling. 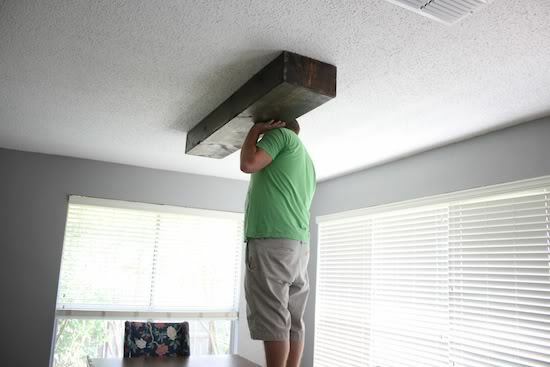 We played around with some different measurements and decided that having it hang down about 6 inches from the ceiling looked the best, so our next step was to construct a wood box (the final dimensions ended up being 60″ long, 11″ wide, and 6″ tall for those of you following along at home). Yup, it’s a box. It was time to stain, but first we wanted to make sure that the box actually worked in the room – we didn’t want to get all the way through and realize it looked ridiculous, so we brought it inside to check the dimensions in the room. Looks good! So, after sanding it down to make sure all of the edges were smooth, it was my turn to step in so I could stain it. I used my trusty Minwax stain in Dark Walnut (pretty much the only color I ever use). Two coats later, we were good to go. Then came the fun (or really awful, depending on how much you like being tortured) part. We had to hang it. We used a couple pieces of scrap wood that we cut down to fit perfectly inside the box, and then we mounted them to the ceiling. The hard part was figuring out where exactly they should go. 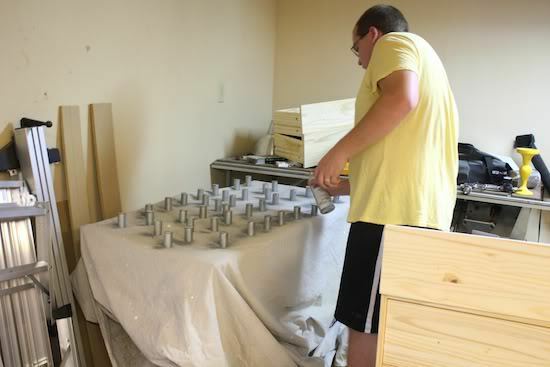 I won’t go into too many details because I’m not the math person in this relationship and it kind of hurts my brain to think about it, but we basically hung them so that the finished box would be centered on the table both lengthwise and widthwise. 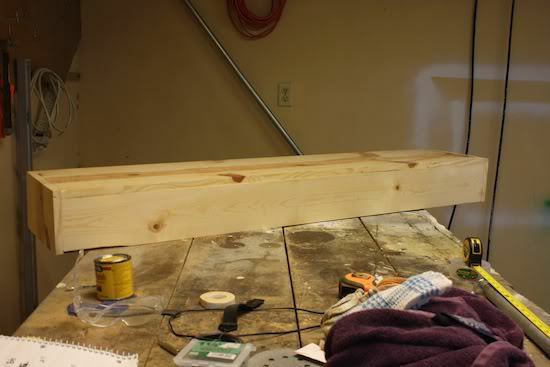 It took a lot of measuring, leveling, and a little bit of cursing (isn’t that an important part of any DIY project?) but soon we had ’em hung. Then, it was time to hold our breath and hope that we had hung them right so the box would fit over them (they had to be perfect since they were cut to fit exactly into the box – if they weren’t even with each other or if they were hung slightly crooked, it wouldn’t work). It fits! Of course, we couldn’t actually hang it yet since there weren’t any, um, LIGHTS on it, but we’re getting to that. Next up it was time to move onto the more fun parts. As I mentioned before, we have 80 light bulbs on our fixture but only 8 of them actually light up. So, 8 of the lights are hung with a light socket and wire, but the other 72 didn’t need to be, and we had to figure out an alternate solution for them (since we weren’t about to spend a million extra dollars on light sockets and wires that we didn’t need). 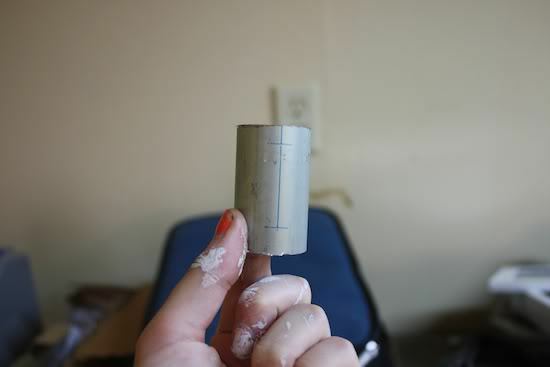 We figured out that the light bulbs just so happened to fit perfectly into 1-inch electrical conduit (the same stuff we used to make our DIY curtain rods), so we decided to see if we could make some faux light sockets out of that. 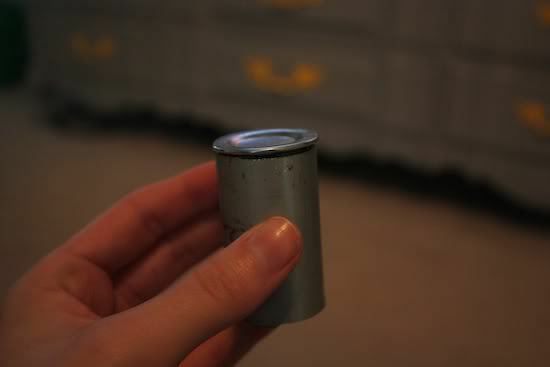 For reference, here’s what our real light sockets looked like. We made our faux light sockets 2 inches long to match the length of the real ones as closely as possible. 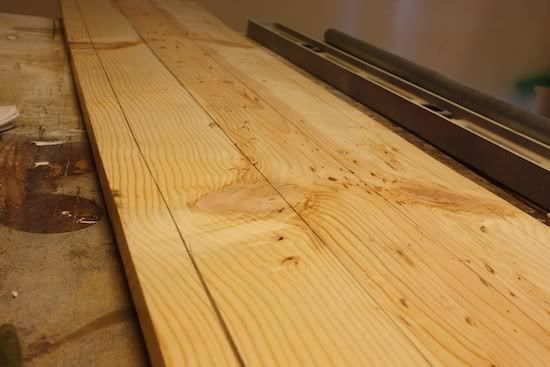 We started by using our reciprocating saw to cut the conduit to 2″ lengths – 72 of them, to be exact. Hey, I never said this was a quick process. And we grabbed our materials and got to work! We used 3/4″ knock out seals for the top, and we needed the pliers and hammer to get them in there, and the super glue to make sure they didn’t go anywhere. Here’s a closer look at the knock-out seal so you can get an idea of how it worked. And then we spray painted all of them. This was a slightly unnecessary step, but the conduit and the knock-out seals are slightly different colors, and the conduit has some writing and random lines on it, so we decided to go ahead and spray paint them a metallic silver so that they are nice and uniform. Once we were done with this step, it was time to piece it all together. Remember, the circled X’s are the ones that will light up. We decided that we wanted the lit ones to all to be towards the middle of the light rather than on the outside edges, and we didn’t want any of them to be the longest or shortest length – beyond that it was random. This was definitely a process and it took quite a bit of time to figure out how to do it, but with a lot of patience we ended up with a light that looks like it was completely random, which was the goal, so it was worth the effort! For reference, here’s what our real wires look like. I cut the rope to the right sizes and made piles of each length, we burned the edges so they wouldn’t fray (and so we could actually get them in the holes), and then we were ready to put them into the light. We plopped down on the couch, put the light box in our laps, and got to work. 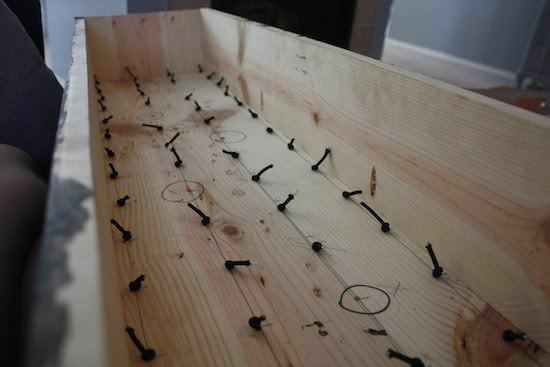 All there was to this part was to push the appropriately sized rope through the pre-drilled holes and tie a knot. We had our little map sitting in the box the whole time and we each worked from opposite ends working to the middle. As you can see, we left the circled ones alone for now because those are where the working lights would go, which means those holes need wire. Once we got them all in, it was time for the wiring. DISCLAIMER: Before I explain what we did here, I want to make it clear that neither of us are electricians, and we’re fully aware that our method wasn’t necessarily the “right” way to do things. My husband is pretty comfortable working with electricity and we felt confident in our method and used this light safely in our home for over 5 years with no issues before we moved out. However, if you decide to try this at home please know that we are not responsible for any issues you have and I fully recommend having a licensed electrician help you if you don’t feel comfortable handling it yourself. 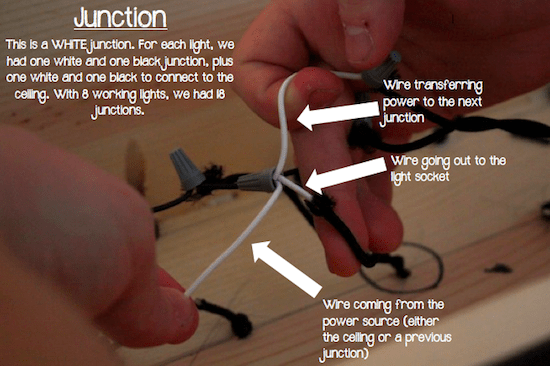 Here’s a little diagram I made of how the light wiring worked for us. Again, there are different ways you could do it, and this is just the route we chose to take. And for a little perspective, here’s a zoomed out photo so you can see how they all connected a little better. Even though it’s not pictured here, you should use a junction box for each connection to prevent any electrical issues. Clear as mud, right? It’s a bit confusing, but once you get doing it you can start to make sense of it! And they needed to be added to the light! I did most of this next part on my own, so I don’t really have any photos, but from here on out the process was incredibly simple: I just stood on the table and grabbed a faux socket, strung the rope through it and tied a knot. Then, I grabbed a light bulb and put a few dots of super glue on it, then pushed it up into the socket and held it for a few second while the glue dried. Then I (slowly) let go and admired my handiwork! There were a few sockets where I had a hard time getting the light to stick into the socket, but with a little extra glue and a lot of patience I managed to get them all in there. I was careful not to add more than a few dots of glue in each socket because I wanted to be able to pull the light back out relatively easily if necessary. Turns out, it was a good thing we were careful with the glue, because once we were done and stepped back, we realized that there were a few areas where several lights were all hung at the same height in a grouping, because even though we had planned the ropes to all be at different heights it was impossible to keep all of our knots the same size so the lengths weren’t exact. But it was no problem to pop the light back out, tie the knot a little higher on one or two of them, and see how that looked. We played around with it until we couldn’t see any areas that looked funny, and then we were done. You ready to see? If you’ve actually stuck around for all 2,700 words of this post (geeze, I talk a lot! ), then you totally deserve it. And if you just scrolled to the bottom to see the photos, then I totally don’t blame you, and you deserve to see it too. Let’s get to the pretty part. We are so in love with this light. It’s exactly what we wanted, and we love that it’s completely unique and something that absolutely no one else has. We constantly catch ourselves just staring at it while we’re in the living room watching television, and we can’t get over how perfect it is for us. 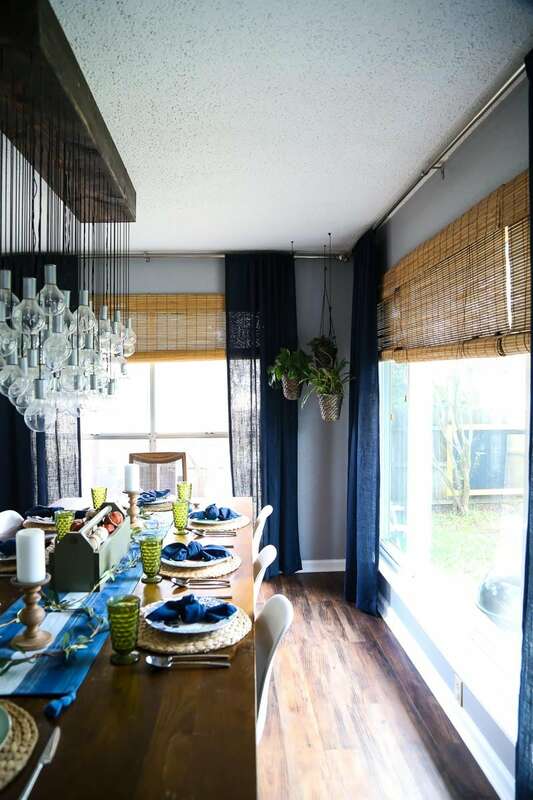 We also love how it looks from underneath – we tossed out a lot of our original ideas because we thought they would look bad from underneath while you’re sitting at the table, but this guy looks just as pretty from under it as it does from the side! And, of course, we love the how it looks when it’s actually turned on. The light from the 8 bulbs that actually work bounces off of all of the other lights, and there’s an illusion that the whole thing is just glowing. It’s impossible to capture in photos, but just know it’s beautiful! I’ll have to have you all over for dinner someday so you can see how it looks in person! Yup. I think we’ll keep it. 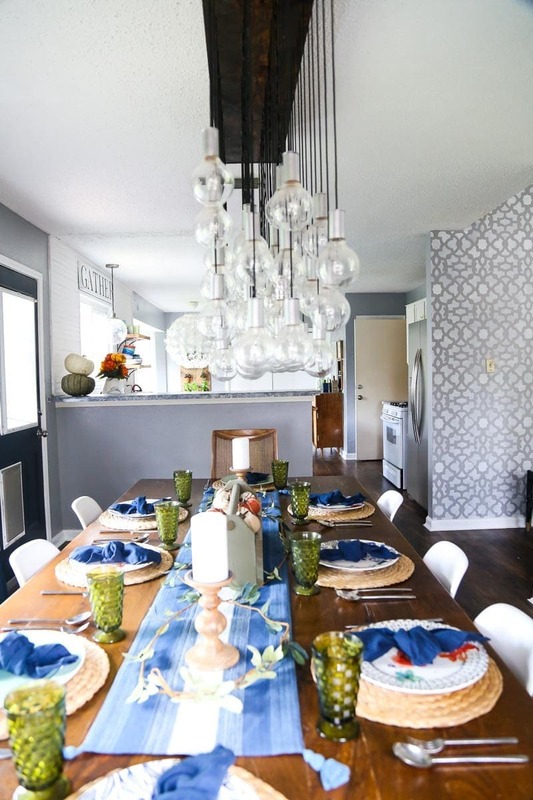 This project was time-consuming, a bit overwhelming at times, and not for the faint of heart, but I promise that if you stick it out you’ll end up with an epic light fixture that everyone who comes to your home will ask you about. Seriously – every single time someone comes over I get asked where it’s from, and we’re able to proudly say we made it ourselves. Now if only I could muster up the energy to replace every light in our home with something this gorgeous! 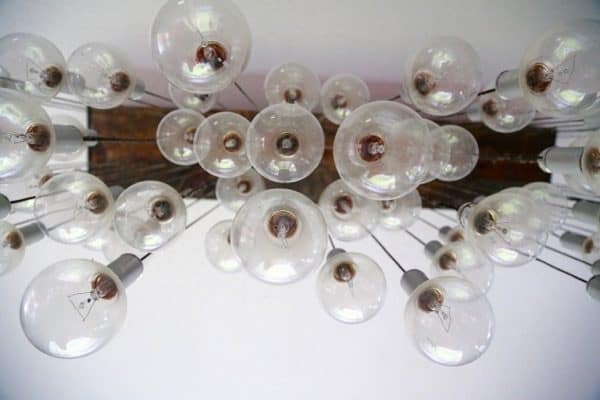 If you could create your dream one-of-a-kind light fixture, what would it look like? Want more easy & affordable DIY ideas? I love this so much! My only confusion is how it is attached to the ceiling? I don’t quite get that part! This is incredible. I need this in my life. I’m just scared to do the wiring. I think I could do everything else. Hi DeeGee – thank you SO much for alerting me to this issue! We’re having some glitches with images on our older posts, but I didn’t realize this post was affected! All of the images should be working now! But, if you do any browsing on older posts, you may notice similar issues, please know I’m actively working on it right now! Hi Amanda. I’m almost finished making ours. I was wondering if you would like photos once it’s complete. 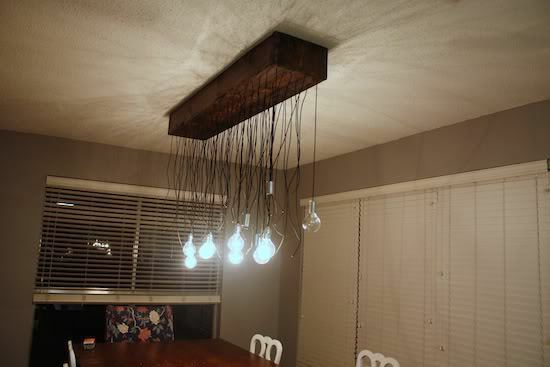 This light looks awesome and I’m seriously debating trying this in my own dining room. I’m a handy guy and think I’m up for the task. My and my wife’s only reservation is that there are no photos with the final chanalier lit and I really want to get an idea of how much the whole thing glows versus just the 8 lights. If you could post or email a photo of it lit up it would be very helpful. Hi Charlie! Unfortunately, I’m not sure if I ever took a good photo of the chandelier all lit up (or, if I did, I can’t seem to find it!). We’ve since moved out of that house and so I can’t snap one for you. So sorry – I can’t believe I never got around to photographing it all lit up. I’ll definitely come back and let you know if I find a photo, though. One thing to note is that we had ours on a dimmer switch and found that was the best way to get just the right amount of light – we rarely turned ours up to full blast, because it was in a room with a ton of natural light already. Hope that helps! It made me gasp out loud! I love this. I don’t have anywhere to put it at this time, but I won’t forget it. Ever. what does it look like turned on? AMAZING!! Love how it turned out–so clever!!! Thank you for sharing. 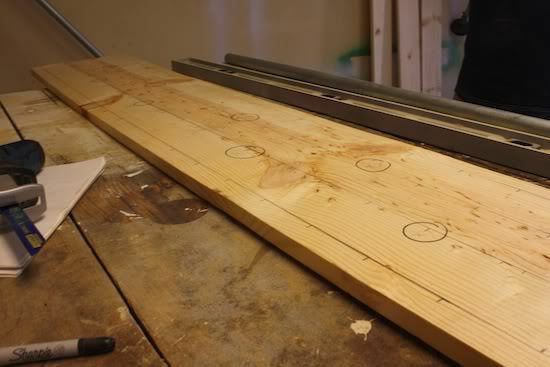 Love the project, what kind of wood did you use how much ? Thanks! 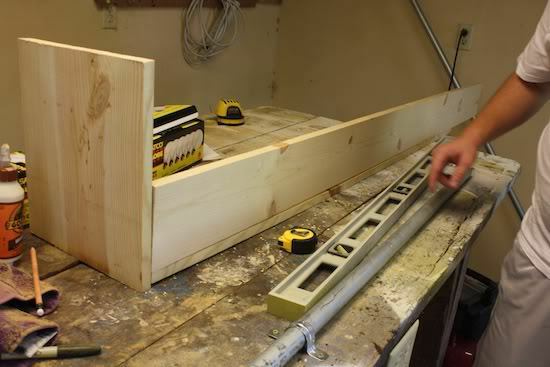 We just used white wood, we made the box from a 6-foot 1″ X 12″. Thanks! Be sure to come back and share if you do make it – I always love seeing photos! This looks absolutely amazing!! You guys did an great job!! I am planning to replicate this…wish me luck! Before i do get started, my only concern is…how do you change a bulb if it goes out? Do you have to remove the whole unit? Nope, you can just switch it at the socket. It’s actually kind of nice because you have an almost never-ending supply of extra bulbs – you can just switch one that isn’t connected for the one that is, since it won’t matter if a non-lit one is burned out. I would love to see a photo of this lit up at night! So excited that I’m starting this project next week! 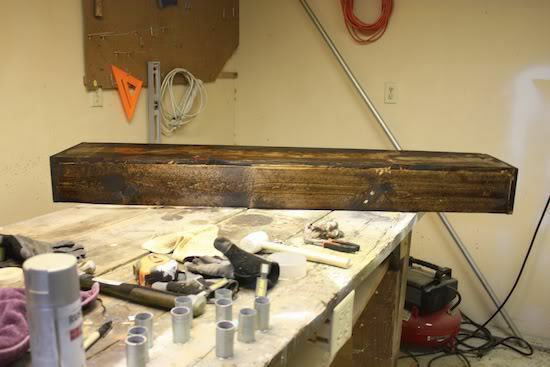 My rustic dining table is 9.5 feet long, so your idea was PERFECT! Going to make some slight modifications, with using all real sockets for all (since I don’t have access a garage full of tools), and using a paracord style wiring vs twisted style, so that the non working sockets wiring match the working ones. And also shorten the box so I have more clearance over my dining table. Before I ordered 90 light bulbs, I wanted to ask you… How do you feel about the 40 watt bulbs? Are they bright enough? Or would you prefer to go with 60 watt?? How exciting! The 40 watt bulbs are perfect – any more would definitely be too much. Our light is on a dimmer switch and we normally don’t even turn it all the way up. I don’t know the exact width, but it was the skinniest rope they sold at Lowe’s. I would guess either 1/8″ or 3/16″. This is awesome! i was searching to make my own dining as well and i think this will be a great tutorial. Thanks for the step by step instruction!!! 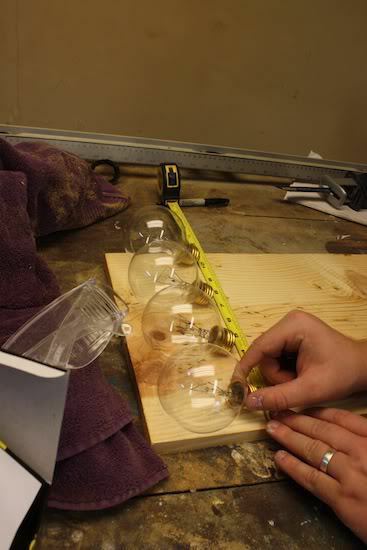 You used crazy glue to hang light bulbs to strings. how does it hold the weight of the faux metal socket? 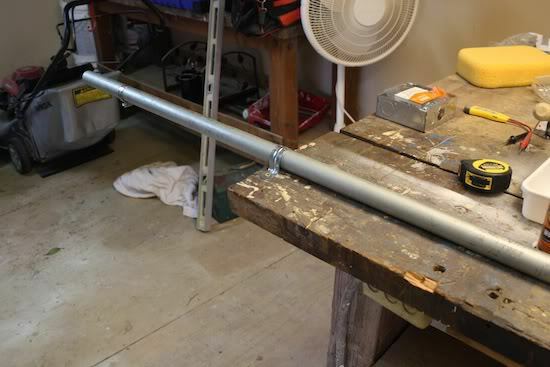 would it be ok to use PVC pipes as faux socket? would it melt due to heat created by light next to it? The glue doesn’t actually hold the faux sockets, those are held up by knots in the string. It holds the light bulbs in perfectly – we haven’t lost any! I don’t see why pvc pipe wouldn’t work…unless your light got extremely hot or was on all the time, but our bulbs never get very hot. Hope that helps! How much wire did u need/buy? It really depends on how low you want them to hang. We just figured out how low we wanted each of the bulbs, then calculated based off of that. My husband is convinced this is exactly what he wants in our dining room. I’m not thrilled on a DIY light, but it is beautiful…. thanks for so many details! This is great! Where did you buy the wiring for your lights at? My husband and I are making our dinner table light out of a whisky barrel and blue mason jars. we have been trying to figure out how to make our own pendant lights like you guys did with a total of 5 lights but it seems like we are constantly finding different methods from everyone and we are getting frustrated. We know we need the sockets, and the ceiling mount for power, we just dont know where to get the electical wire and how to hook it all up without burning our house down. that would be a bumber. The wire is from 1000Bulbs.com – you can find it here: http://www.1000bulbs.com/product/65786/ELEC-D8302-10FT.html … I can’t help you on the hooking it up part because that was all Corey’s doing and I don’t feel confident enough to give out electrical advice, haha. Good luck!! I’m in a similar situation, where I’m building the chandelier out of a cast iron pot rack. I’m worried about the wiring and not burning my house down! Amanda, I just sent you an email with more details, if you can please help me, I’m super excited to try this project! You guys are awesome!! Amazing job concise and humorous tutorial. I’m looking to make something similar but with branches in lieu of bulbs and you have just given me a rainbow of confidents. THIS IS AMAZING!!! Exactly what I was thinking of for our dining room in our new house (if it ever gets build)! I so want to steal this. Just not sure I can do it. Great job. What is the wall color? I love it! Thank you for posting your plans on here! 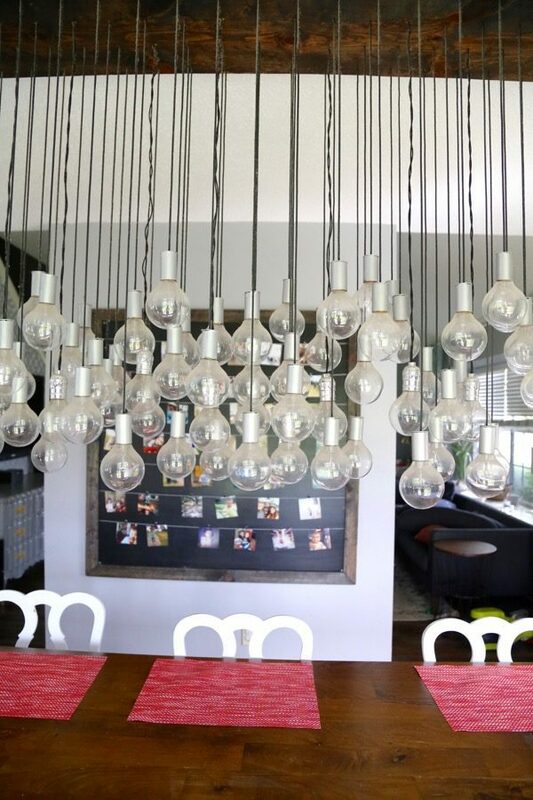 My husband said to me the other day, I would love a light that has multi strands and uncovered bulbs for over the kitchen table, what do you think those cost? So we went out and the only ones we liked were around 3,000 dollars. I recalled seeing your blog and said wait a minute I think we can tweak the plans I have seen on this wicked girls blog and we can do it ourselves. We took your light as inspiration and made some adjustments and voila the coolest modern light ever! we made the box 3 feet and recessed the bottom piece with the holes so that it was less noticeable, then we sprayed it with prosche silver car paint and a hight gloss clear coat (thank goodness my father manages an autobody shop). 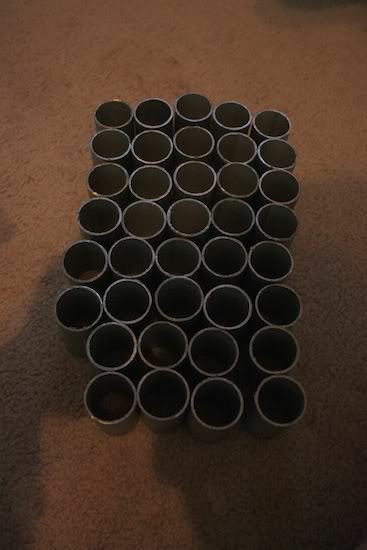 My hubby ordered colored fabric covered wire from the UK and we bought all real ceramic sockets for all 48 bulbs. We sprayed them along with the hartdware to attach it to the cord and the effect is so goood it looks like we purchased the light at a high end modern store. I wish I could post a picture in case anyone wanted info on the items we used and to show you what you inspired. But wanted to thank you for helping us accomplish our dream light project. Our cost however was $650 since all the sockets were real, but compared to 3K we were pleased!! Very beautiful. great job on the wooden box, cool finish. Impressive indeed. I love your light and I am attempting it with help from my husband. Where did you get the fake wire rope? I can’t seem to find any at the hardware stores around me and I am wondering where else to look. Thanks so much! This light fixture is incredible. I think it’s beyond my DIY skills. But it’s inspirational and truly beautiful. O. M. G. ! This is INCREDIBLE! I don’t have a great space for a chandelier like this in my house, but I wish I did! Congrats on an amazing DIY job! I love love LOVE it! Congrats on getting into the contest!! This project is simply amazing!!! Well deserved! Can’t wait to see what other amazingness you come up with! My boyfriend and I spent the last month recreating our own version of this dining room light. First of all this has been one of the most fun projects we have ever done! And your plans have been invaluable!! We are soooo pleased with the results. We made a few changes: we downsized to half the size (as my dining room & table are very small) and made it with 40 bulbs, shortened the length, found an easier way to make faux sockets (using 3/4 inch PVC female adapters) which cut the work time by lots, and we were able to screw in the bulbs so we can reuse later if needed. We’ve had so much fun, we are now inspired to upgrade and redesign my tiny kitchen! Just want to say a huge THANK YOU for your plans which are well developed, inspiring, and even funny! That’s so exciting! I’m glad to hear our plans were useful! 🙂 I’d love to see photos if you have ’em! Amazing job! I love that he is standing on the table while the table is set with dishes! I pinned this and hope you will stop by my website and submit it for me to feature! This looks so great!! 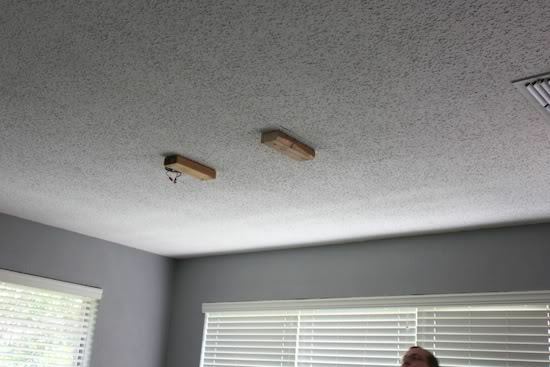 DIY fixtures like that can look very tacky, very quickly. You completely avoided a tacky look! I’m in love! Hopefully this project gets you into Creating With The Stars!! An amazing amount of work, but with amazing results! Very cool. Wonderful job! 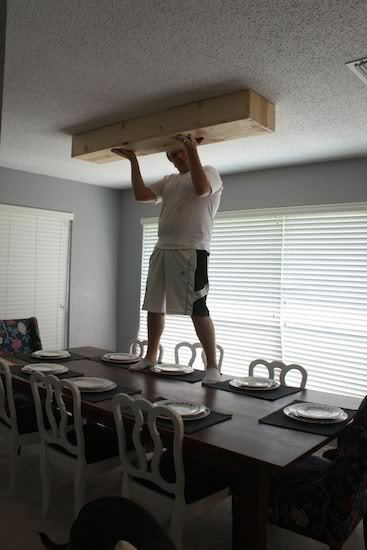 I hope Corey wasn’t scolded too much for standing on the dining table! I noted that the holes in the knockout caps were rough edged. No doubt that a standard twist drill bit was used. 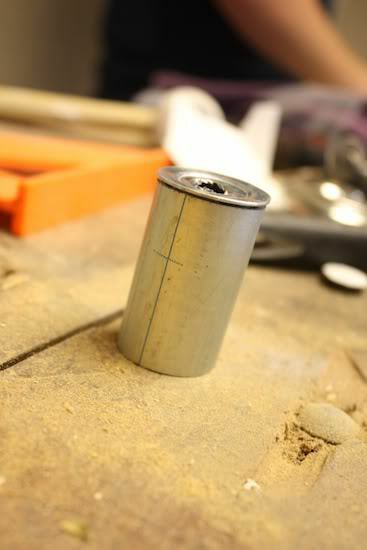 One my metal projects, I use “stepped” drill bits, as they leave a smooth edged hole. These bits make very clean holes without the sudden pull through at the end as with a twist bit. I also use a bit of cutting oil to ease things along, too. Thanks so much – and, no, it’s a super sturdy table, so we stand on it surprisingly frequently as needed. Thanks for the tip! 🙂 This was our first time playing around with this sort of stuff, so we were definitely making it up as we went along! I also spotted that light and I was and still am in love with it absolutely. Thanks – glad we could help! Great Job!!! I would only suggest that you put some kind of rubber edging on the holes your drilled for the “real” lights. 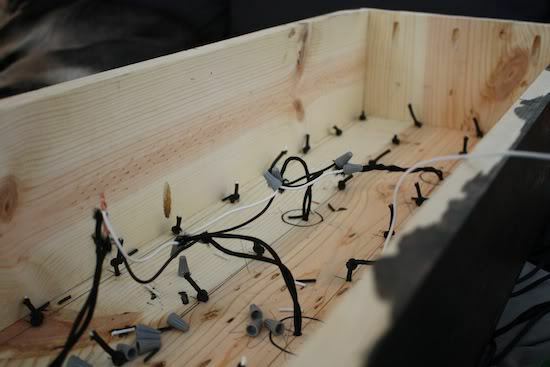 The sheathing on the wires could be cut and then you would have a rather ‘hot’ light! I would have also suggested that you tape each connection with electrical tape or put them in boxes. These suggestions are for safety only coming from an electricians daughter!! Yet your light is gorgeous! I think I will make one similar to it but smaller. Since I am renting I will somehow make it so I can take it out and put the original one back in when I leave. great job! It’s totally possible if you DIY it! 🙂 We did ours for under $300. Hi this absolutely gorgeous -and by far the best diy I’ve ever seen!!!! Hi Amanda! I’m in love with this fixture… it’s so unique and really well crafted. Awesome job! Each Friday I highlight DIY projects in a series I do, and tomorrow I’d like to feature this project if that’s ok with you. Just wanted to let you know, in case you want to check it out! Again, beautiful job and beautiful blog!! Hi Jenna! Thanks so much – I’d be honored to be included! Congrats on being featured on Centsational Girl! You must be so excited! Wow! This is very nice. It’s very educational information and very inspiring post. I will make it also for my dining. You impressed me from your unique chandelier and from your patient of your effort. Great work! AMAZING! Great tutorial and fantastic results! I am loving the fake sockets! Great job! Arg, this so so mindblowing that I need to try convincing my dad to help me to do this! WOW! looks fabulous!!! love it! great work you guys!! Wow! That is super impressive. I’m also amazed at your patience and skill. It really does feel like organzied random lights. I missed it…but Ithink that you should call it a chandelier. Stunning!!! P.S. Popped by from Addicted 2 Decorating. I don’ usually post comments, but I had to make an exception in this case. 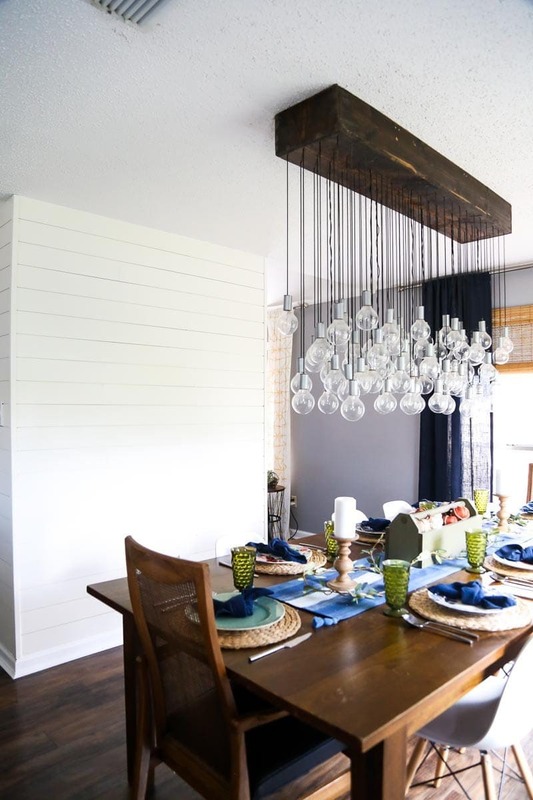 Your light fixture project absolutely blew me away. The time and patience and team work that obviously went into this is priceless. 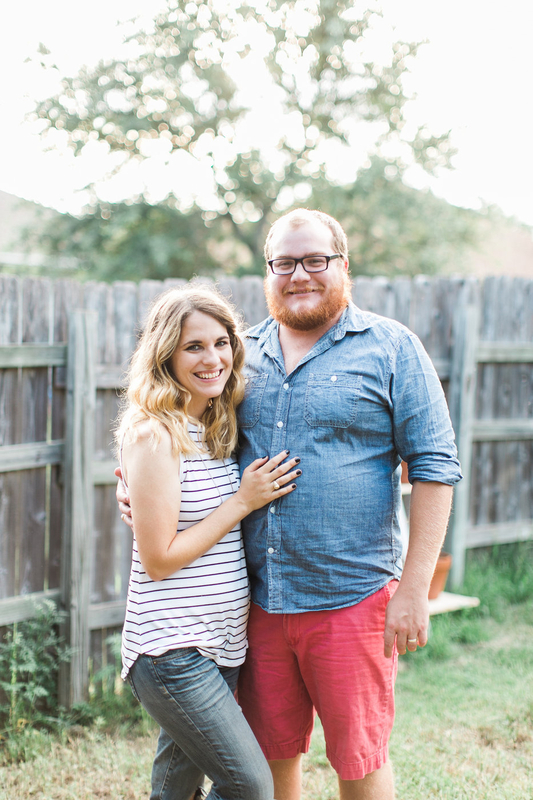 I am in awe of your accomplishment and am adding your blog to my favorites. Congratulations on a beautiful project. I am in awe of how great this project came out. It looks beautiful! Unbelievable! How amazing are you? Pretty amazing! I love this. I need to find a place in my house to do something like this. Pinning right now. This light is incredible. You both did an amazing job!! That is AWESOME! I am in awe. Wow. I LOVE how it turned out! Looks great! I tried making a light once. This gives me hope to try again it is just THAT awesome! This is pretty much amazing! I can’t believe how much work you guys put into making this happen! HOLY CRAP!!! 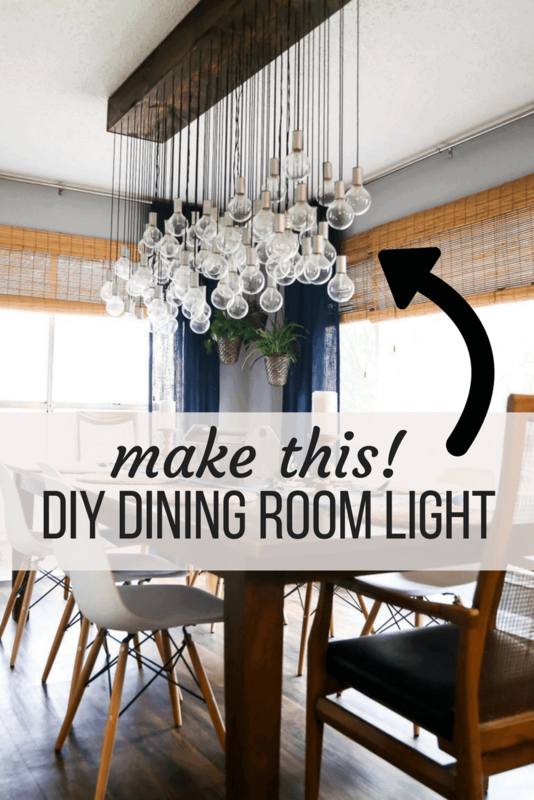 You weren’t kidding when you said you DIY’d a large light fixture! I don’t think calling this LARGE does it justice! WOW!!! It looks amazing! And I love that all the wires hang straight!!!! (I’ve seen ones where the wires are kinked and it looks weird) yours looks great!!! It’s like an Edison light on crack! TRULY AMAZING! wow ! Great Job!!! You guys are awesome! Ahh, thanks so much Ashli! 🙂 We’re pretty happy with how it turned out, haha. This was so awesome, I shared this today on my blog as a Favorite Project from the Summer Pinterest Challenge! I can’t believe how great this came out. It looks amazing!!! I. Love. Your. Light. Oh my goodness! You two nailed it! It looks so pretty! The coolest DIY project I have seen in a very long time! Very unique and spectacular! Its mesmerizing! Oh my goodness, this is crazy good!! I have been wanting to a smaller version in my walk in pantry for ages, but had no idea where to start. Thank you so much for the detailed tutorial. Pinned! Hi Amanda: Wow–this is just gorgeous! Such a dramatic look–I love it! Thank you for the step-by-step details–it was very informative. Take care, and have a wonderful week! I never would have guessed that this was homemade. It looks super professional and just all-around gorgeous. You guys totally rocked this project! That is so beautiful!! You guys are really talented. I was excited to see it on the list of YHL reader-submitted projects too! Wow…….all I can say is WOW!! I am SO impressed! You guys did an amazing job. Definitely time for a dinner party. I just… I can’t… even process. Seriously. I cannot get over the awesomeness. Amazing job!!!! Oh my GOD!! This is absolutely incredible!! You guys should be so effing proud of yourselves. You are truly so, so good at this stuff! I can’t believe it!! I love this!! How awesome that you guys made this yourselves! This is my favorite project of yours yet, and all your others have been amazing. This is stunning. Nice job. WOW. WOW. I am so, so impressed that a) you thought this up and b) you had the patience to pull this off!! It looks amazing. I hope you guys finished it before your cruise so you could take a break and celebrate your huge accomplishment! Holy crap!! That is amazing! It turned out SO good! I can’t believe you guys DIYed it! Holy cow! This is so amazing and so well done. I can’t believe you did this for $250. You guys are awesome! So adorable! I definitely want to come over to check it out in person, but not share this with my husband. I’m sure he want to make it, but with all of the bulbs working! Wow. This looks like it is straight out of a magazine and if I were lucky enough to dine at your house I would be completely mesmerized the entire time. I’ve scrolled back up to look at it 3 times already while writing this comment! E.T.A. : The only thing I would encourage you to do is put the wire splices inside of a secured junction box w/ a cover plate as a fire safety/ fire preventative measure. You can probably fit two or more splices in a junction box depending, its the size 🙂 Seriously love this project!! please know that as I write this my jaw has dropped to my desk. You guys are so dedicated. I’ve done a couple home DIY projects and almost gave up after 3-4 hours worth of work. I’m so impressed with how meticulous you are and how perseverant! Awesome job, truly. It turned out beautifully. How I wish we werent’ renting and could do this…. Question: are you worried at all that with a fan or open windows that the lightbulbs might bump against eachother and break? Thanks! 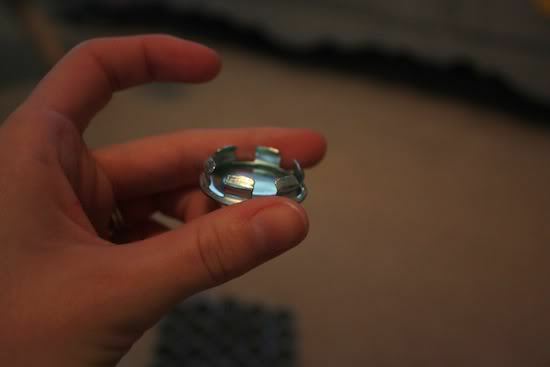 No worries at all about them breaking – they’re very sturdy! We’ve bumped up against them several times when we’re putting stuff on the table, etc. and they just move around for a few minutes and then settle. They’d have to get moving much more than a fan or breeze could possibly do in order to break them! wow, that is quite the challenge to undertake! you guys rocked it! Oh wow!! You guys did such an amazing job, I love it! Wow, this is SERIOUSLY impressive. It’s so beautiful, and it looks just like your inspiration! I’m really envious of your DIY skills! YOU WIN (even though it’s not really a competition). Seriously, I’m pretty sure no one participating in the Pinterest challenge can top this. WELL DONE! Um…that is the most beautiful light fixture I’ve ever seen!! You did such an amazing job!! I hope you’re submitting it somewhere because everyone needs to see that! dude. this is really effing awesome. i seriously wish i had skills like you and your hubs. this ROCKS. that looks amazing! you guys are geniuses! WOW! All I can say. You guy’s did a great job!! Wow, that looks so awesome, wouldn’t be surprised if they asked you to co-host for the next challenge!